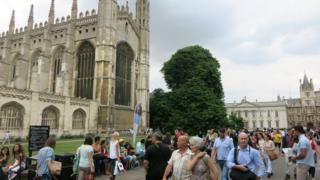 Tourists flocking to King's College in Cambridge are a potential terror target, councillors have heard. Large crowds of sightseers regularly gather on King's Parade, described as the city's busiest tourist street. But counter-terror police have said the street could be vulnerable to an attack with a lorry or other large vehicle. New traffic controls were approved at a meeting on Tuesday, which also heard plans for anti-terror barriers to be installed. The joint city and county council committee heard there were fears of an attack similar to the one in Nice, France, in 2016. A terrorist drove a truck into a crowd of Bastille Day revellers, killing 86 people. Suzanne Hemingway, strategic director at Cambridge City Council, told the meeting there was no "specific threat" to King's Parade, but the national threat remained high. "The advice to Cambridge is King's Parade is our highest risk street and approach from the south is potentially the area someone could carry out a vehicular attack," she said. Image caption Members heard existing bollards outside St Mary's Church would provide some protection but would be "limited"
Members heard existing bollards outside St Mary's Church would provide some protection but this would be "limited" in an attack. "Vehicle containment measures" like barriers and concrete blocks were discussed as ways to prevent vehicles being driven "at speed" into pedestrians, said the Local Democracy Reporting Service. Liberal Democrat councillor Amanda Taylor expressed her opposition to the scheme. "I am sad the threat of terrorism is pushing us to uglify one of the most beautiful parts of the city," she said. Leader of the Labour group at Cambridgeshire County Council, Joan Whitehead, said "no-one thought Nice was a specific threat" and local leaders needed to prepare for all eventualities. "We can't go on with a wing and a prayer that no one will drive at high speed down Trumpington Road into King's Parade," she said. Councillors voted to support the introduction of further controls and the use of an Experimental Traffic Regulation Order. This could include a "chicane" style arrangements and a physical barrier north of Bene't Street.